Abstract booklet from the first Minnesota Undergraduate Scholars Posters at St. Paul event. The multi-disciplinary poster presentation was held at the State Capitol in St. Paul on February 26, 2014 from 11:00-1:00 PM in the Rotunda. Participating campuses included: Anoka-Ramsey Community College; Bemidji State University; Inver Hills Community College; Metropolitan State University; Minneapolis Community and Technical College; Minnesota State University, Mankato; Minnesota State University, Moorhead; North Hennepin Community College; Rochester Community and Technical College; St. Cloud State University; Southwest Minnesota State University and Winona State University. 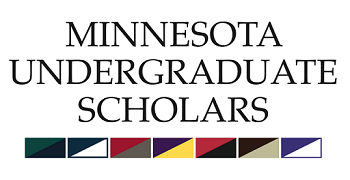 Minnesota Undergraduate Scholars, "2014 Minnesota Undergraduate Scholars Posters at St. Paul Abstract Booklet" (2014). Posters at St. Paul. 1.